Work with me and your book will get done. I offer writing, rewriting, editing, and publishing services. I custom design my service for you to meet your needs, your budget, your schedule. I help Christian leaders and anyone with a positive message or story. I work on inspirational, life story, Christian testimony, leadership, educational, self improvement, Bible study and related books. My specialty is nonfiction. Want to see examples of books I’ve worked on? Looking for other good resources to help you as an author? You have final say on the content. My name appears in/on your book ONLY if both of us want it to. You don’t need to write a single word; I can work with a blank slate, our conversations, independent research, your completed manuscript, your partially completed manuscript, your notes, your blog, recordings of your presentations or almost anything else. Many best selling authors and Christian leaders hire someone to write their books for them. It’s a great way to multiply your influence and reach more people. If you speak or lead, it makes sense to transform your sermons, your vision, your story into a book that you can give to first time visitors, make available to donors, use as a small group study, sell at a back table, or make available on Amazon or Kindle. Work with me, and your book will get done. All rights will belong to you, and you won’t get locked into a contract that you can’t walk away from. I’m a national award winning writer with over 25 years of experience, and I’m a committed Christian specializing in Christian inspirational, devotional, life story, testimony, leadership, Bible study, self improvement and educational books. Turnaround time depends on the amount of work needed, but two to six months is common. I’m a writer, not a copy editor. Copy editors check your manuscript for errors and inconsistencies. As a writer, I take the time to understand your message and how it best connects with your reader. Then I evaluate every line of our manuscript to make sure what we are creating together sends the kind of message and produces the kind of response you want from your reader. Revisions are a normal part of the process. Will I steal your idea? No. Here’s why: I don’t have your expertise. I don’t have your experience. Therefore, I cannot write with your authority, unless we agree to collaborate on a book together. In other words, I don’t have the ability to steal your idea. Moreover, I don’t have the time. With so many ideas of my own that I’m excited about, I really don’t need any ideas from anyone else. My current solo project is a paraphrase of the Bible, and that’s going to keep me occupied for a long time. So unless that’s your idea, we’re probably safe. Finally, it’s not in my character to steal ideas. I’m a win-win person. I like arrangements where everybody comes out ahead. If, for any reason, I think there’s any conflict of interest between your idea and anything I’m working on, I’ll let you know immediately. Do I charge a fee? Yes, I do. This is how I make my living. The amount depends on the type of service you want. Keep in mind that if you use your book to promote your business or ministry, my entire fee may be a tax write off. My fee is based on the number of words, and you can pay in installments. I usually charge between 8 and 30 cents per word depending on the project. Sorry, I don’t do split-the-profit projects, unless you’ve already sold a million copies of a previous book, and we have good reason to think you’ll do the same with this one. Please note that I am not always available to take on every project. I reserve the right to turn down any project at any time for any reason or for no reason. You want to publish with complete confidence. For example, you don’t want to share a story you heard as a true account only to find out after your book is in print that it is an urban legend. You don’t want to make embarrassing mistakes with wording or quotations. I fact check your material where possible. Is the story really true? If I can find it online, I check, and make adjustments where necessary. If you quote Bible passages, I check the quote to make sure you have the correct wording, the correct reference, and the correct translation. I also include the appropriate copyright notices. While I’m not a literary attorney, and I CANNOT take the place of one (you NEED to hire one if you have any questions about what you’re publishing), I do try my best to spot any material that exposes you to potential liability. Sometimes an author’s wording may send an unintentional negative message to some readers. My radar is up for that. If I see wording that I think could offend your readers or distance them from you or your message, I rework your material. Sometimes an idea makes sense in an author’s mind, but doesn’t make sense as expressed on the page or screen. Sometimes that means I need to pull apart the elements of your message and reassemble them in a way that will make more sense to your reader. When you quote someone, I try my best to find that quote online to ensure accuracy. While doing this, I often find quotes that are attributed to the wrong person, and I straighten that out for you to save you the embarrassment of find that out later on. Where possible, I check your material for plagiarism. It’s easy to download someone else’s material, forget where you found it, and years later assume it was your own. I can’t guarantee I’ll find every instance of this, but my radar is up for this, helping you avoid a lawsuit. I can, for a fee, help you obtain permissions to use copyrighted material, or I can give you instructions on how to do that yourself. I check for word choice errors. Hundreds of words sound alike but have very different meanings: raise or raze, carrot or caret, prostrate or prostate, your or you’re to name just a few. It’s surprising how often I find word choice errors even when authors have advanced degrees. Where you reference people, I usually double check spelling for you. Did you really mean Dennis Whaley or did you mean Denis Waitley? Did you mean Jim Rhon or did you mean Jim Rohn? Of course, I also check grammar, syntax, spelling, punctuation, word choice. Many authors don’t understand that spoken language does not work on the screen or on the written page. I make those adjustments. I have years of experience crafting Christian books. I understand the nuances of communicating to evangelical and related audiences. I see strengths, weaknesses, opportunities, and threats in your work that many editors would not see. I do my best to get behind your idea, and, where necessary, craft a stronger, cleaner, truer way of saying exactly what you want to say. Your story can change lives. You can make a difference, and your book can advance your cause, extend your influence, strengthen your credibility allowing you to reach new audiences, access new opportunities and make a difference in your world. Your dream of writing a book can really happen. It starts here with a simple email. We’ll move forward at a pace that’s comfortable for both of us. Start by telling me a little bit about your project, and I’ll help you identify next steps that make sense for your goals and your budget. If you are looking for a way to get your book into print, I’ll guide you through the self publishing process and help you avoid many of the traps and pitfalls that trip up inexperienced authors. Super easy! I do all the work for you. As an experienced author and self publisher, I will steer you around many of the pitfalls that trap inexperienced authors. As an experienced ghostwriter, I can also help you re-purpose and rewrite your material if you want me to (see above). You earn a generous royalty on every book you sell. You don’t need to fulfill a single order. The publisher will pick, pack and ship your book to your reader for you. You earn a much bigger slice of the pie than you typically would with a traditional publisher. You may order inexpensive author’s copies from the printer—any number, anytime you want, but you are not required to do so. Give them away or sell them. You set your own price on your book. Within reason, you can set whatever price you want. Your book can become available worldwide (major markets) if you want it to be. You keep all rights. You never get locked into a contract that limits your right to do what you want with your own material. Publishing your book is a big job, but I take care of everything for you, so you don’t need to worry about a thing. I start by helping you set up a free account with Amazon’s publish-on-demand platform. I use your photos or Creative Commons images to create your book cover. You, of course, have input inot the design and make the final approval. I make sure that our cover is printable which means I create the front and back cover, spine and bleed all at the same time. 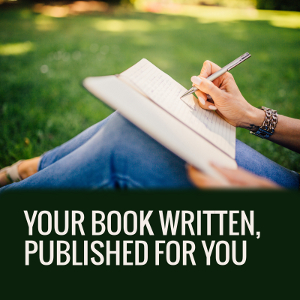 If the back cover contains copy (words), I help write or edit them for you. I prepare your manuscript for printing. Many first-time authors underestimate how important this step is. A poorly designed book interior makes the book look cheap and makes it difficult to read. In addition, I help you select a trim size, write promotional copy, write an author’s bio, select a BISAC book category, develop key words, set up distribution channels, price your book in the USA and internationally, and plan royalty payments. My service is quick and affordable. As an author, you need to be careful where and how you publish your book. Many publishing houses not only take away your rights to your own content, but to any future content you create. Talk about unfair! Not here. You own the content. You are free to republish elsewhere in addition if you like. You are free to do develop spin offs and derivative works (which are sometimes more profitable than the book itself). I’ll get your book in print with Amazon’s print-on-demand service. That means you don’t need to maintain an inventory. Books are manufactured as you sell them or as you order them. You can order as many copies as you want any time you want and sell them yourself, or your customers can purchase copies directly from the printer and/or Amazon.com and you get paid a percentage. If desired, I’ll also convert your book to Kindle or other e-book formats. For the uninitiated, converting a book to Kindle—and doing it right—can be about as much work as putting a new transmission in your car. Yes, there are automated conversion services, and I use them, but a thousand things can go wrong in that process. I’m the guy that can go through all 6,000 lines of html code for you and fix the problems. I do not publish hardcover. We may be getting into audio books in the future, but we haven’t done any yet. I publish a variety of trim sizes with 6×9 being the most common. My fee for the above services is usually $300 to $700 depending on the project. If I’ve written / re-written your book, I sometimes waive some or all of this fee. Since 1983 I’ve written thousands of resumes for job seekers. I make it easy for you. I interview you over the phone and / or work from your source material. The more you know about the kind of job you want, the better job I can do for you. I charge $100 for a basic resume, payable after our phone interview, before I start writing. I will email you a resume in doc, text or pdf format. I’m easy to work with and revisions are no problem. If you mail a check, please call or email so I know to expect it. Thanks! Your book can open the door to speaking engagements, new clients, new opportunities to serve and more. #1 How do you define success with your book? #2 How does this book fit into the big picture for you? #3 Who is your reader? #4 Why will your reader want to own and read your book? #5 How do you want your reader to respond? #6 How will you get this book into the hands of your readers? #7 How are you going to meet your goals? Word count is based on your original manuscript (if available), my drafts, or the final manuscript whichever is larger. (2) Revisions / The (re)writing process includes up to two rounds of revision. If you want changes in what I’ve (re)written, I will make those changes for you. While I will want feedback during the process, as a rule, I prefer to make all revisions at the same time. (3) Size of book / Your book will be approximately ______________ words. (4) Book cover development / Development of print-ready front and back covers with spine based on Creative Commons images and/or high resolution original images supplied by you. You certify that you own appropriate rights to any images you supply. Model releases are required for any recognizable living people. / $300. (7) Price and terms / The total price for the above described services is estimated to be $_________ with $_________ due up front, with the balance / additional installments due ___________________. You will also supply me with a free copy of your book when we finish. (8) Ordering and selling your book / rights / You may purchase copies at an author’s discount and resell them or give them away. Alternatively, you may direct people to an Amazon page where they can purchase your book, and you receive a royalty in 60-90 days. I do not guarantee that any number of your books will be sold. Once my fee is paid, you own all rights to your book. (10) Walk-away provision / If, at some point, either of us decides we don’t want to move forward with this, my fee amounts to _______ cents times the number of words in the portion of the book which I have completed a first edit/write at that time. You would then owe that amount, minus any payments you’ve already made. If we’re working on your book and 60 days pass without contact from you, I will consider the project abandoned by you and any payments forfeit. (11) Use of my name / My name appears on/in the book ONLY if both of us want it there. If the above does not fit your goals, budget, schedule or other needs, I can work up a different proposal based on additional information you supply, but this different proposal must be agreed upon by BOTH of us BEFORE I begin my work. Writing and publishing your book is a big job, and I’m here to help you get it done.